New office move coming up- no worries! Here’s a complete checklist of everything you need to remember to have a successful move. Do you own a business that’s preparing to relocate? Are you wondering how to move into a new office without losing productivity or clients? How can you enlist the help of your employees, movers, and the like, to ensure a smooth transition? Businesses move all the time for many reasons—to scale back or accommodate growth. To save money, get closer to customers or employees, to enjoy a new neighborhood. Whatever your reasons, this can sometimes be a challenging task to undertake. But it’s a worthwhile one. As long as you plan ahead, are realistic about budgets, and do the research, you should be able to crush your move. Here’s a checklist that’ll help you cross your Ts and dot your Is! One of the most important first steps is creating a moving plan around your timeline. Depending on your departure date, you can create a list of monthly, weekly, and daily tasks to help you prepare. It usually takes about 4-5 months for a workplace to entirely shift into another. With this in mind, develop a packing plan. If you need storage in the interim period, review your storage facility options. You can put anything in there that you don’t need on a day-to-day basis. Review and compare price and size options for your new location. Create a floor plan for your new office that will help ease the transition pains. It’s essential to make your employees a part of the move. After all, they’re part of the heart and soul of your business. Keeping them engaged during a move ensures customer retention and more. With them in mind, consider things like transportation, employee parking, and staff input. You can even distribute a moving guide that outlines the logistics of your company’s move. An office move requires the same kinds of material as a home move: plastic wrap, cardboard boxes, industrial tape, labels. If you want to make your move as swift as possible, have everything packed and labeled by the time your moving company shows up. Labels are of utmost importance here. Label boxes based on their function, priority, and the like. Labeling makes unpacking and adjusting to your new spot even easier. Get rid of un-needed clutter items first. Only keep around belongings until the end that are necessary for daily operations. Have each employee pack their own desks. Pay particular attention to the IT side of your operation. Make sure things like computers, servers, and such are properly broken down and set up in the new space. It helps to take photos of the original setup, as you can mimic it later. And don’t forget your change-of-address forms! These are vital to a continued operation post-move. And of course, nothing takes the load off your move (literally!) quite like commercial and office movers. They know the ins and outs of the process, from moving awkward furniture to using the best packing supplies. They can ensure the smooth, safe transportation of all your important belongings. Professional movers can move anything from cubicles and desks to cabinets and more. Now that you’ve got a better idea of what a move entails, you should be able to enjoy your relocation! Moving into a new office can be stressful, but don’t forget what it really is – an exciting, new opportunity for your business! If you’re relocating within the NYC area, we’d love to help. Let’s check off one of the steps on your checklist together. 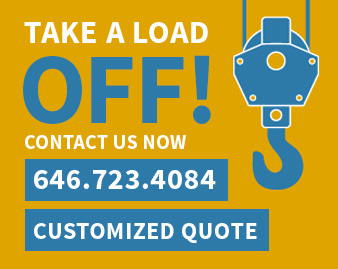 Contact us for a free on-site estimate today!